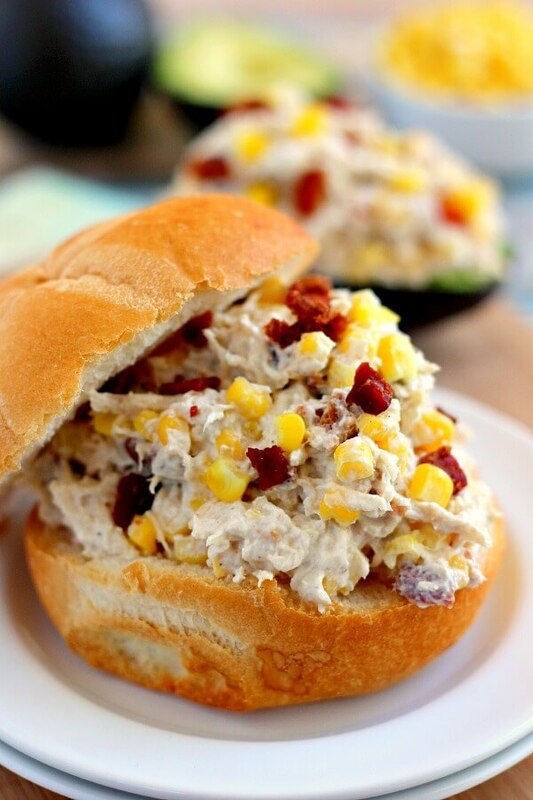 This Lightened Up Zesty Chicken Salad is filled with tender chicken, fresh bacon, and corn, combined with a light dressing! Now that we’re officially into the first week of May, I’ve got warm weather food on the brain. I dream of grilling burgers, feasting on salads, and devouring lots of fresh fruit for dessert. While the hubster and I have been indulging in some of our summer favorites already, I can’t wait till the season is actually in full swing. I’m jumping just a little bit ahead of myself, though, since spring started not too long ago! One of my favorite dishes to indulge in year round (but specifically when the weather gets nicer) is chicken salad. It’s a great addition to sandwiches and makes a delicious lunch or dinner. And since it’s been a while since I’ve had it, I decided to whip some up so that it cures my summer food cravings. 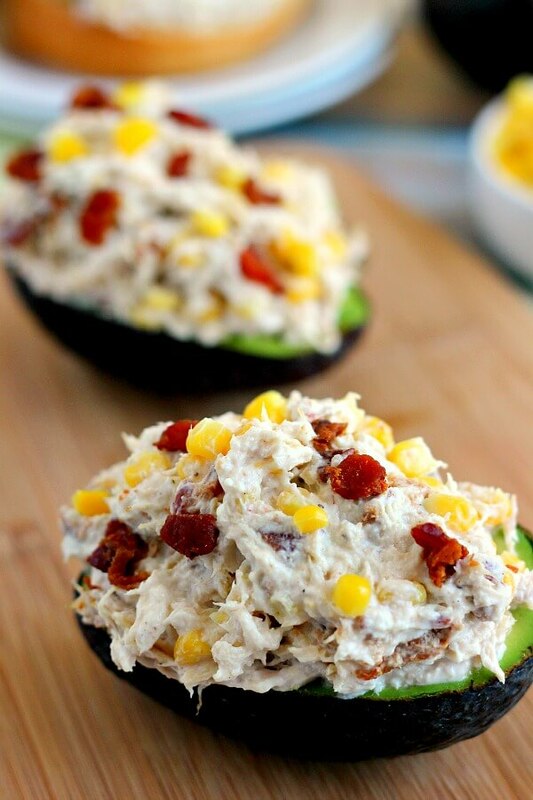 But unlike regular chicken salad, this Lightened Up Zesty Chicken Salad is filled with tender chicken, fresh bacon, and corn, combined with a light dressing. Instead of using mayonnaise as the base, I used a mixture of nonfat, plain Greek yogurt and just a touch of mayonnaise. The Greek yogurt lightens up this salad, without sacrificing the calories. And anything that cuts the calories (and fat content) in half is a winner in my book. Did I mention the how delicious this Lightened Up Zesty Chicken Salad is? By using rotisserie chicken, bacon, corn, and just the right amount of spices, this salad blends together to create the ultimate dish. And while bacon isn’t exactly calorie-friendly, you’ll only use a few pieces to provide a smoky flavor. Combined with the Greek yogurt and a hint of mayo, this salad makes the perfect lunch, dinner, or evening snack. And because the ingredients are simple, it takes just minutes to whip up this flavorful dish. Simply combine the yogurt, mayonnaise, bacon, corn, and spices until well blended. Add in the chicken, stir to combine, and this chicken salad is ready to be inhaled. This Lightened Up Zesty Chicken Salad is perfect to serve on some fresh bread as a sandwich, straight from a bowl as a traditional salad, or my favorite: on an avocado! Since I could pretty much eat avocados all day, every day, I knew this chicken salad was almost begging to be the topping for this veggie. And let me tell you, this combo is out-of-this-world-good! 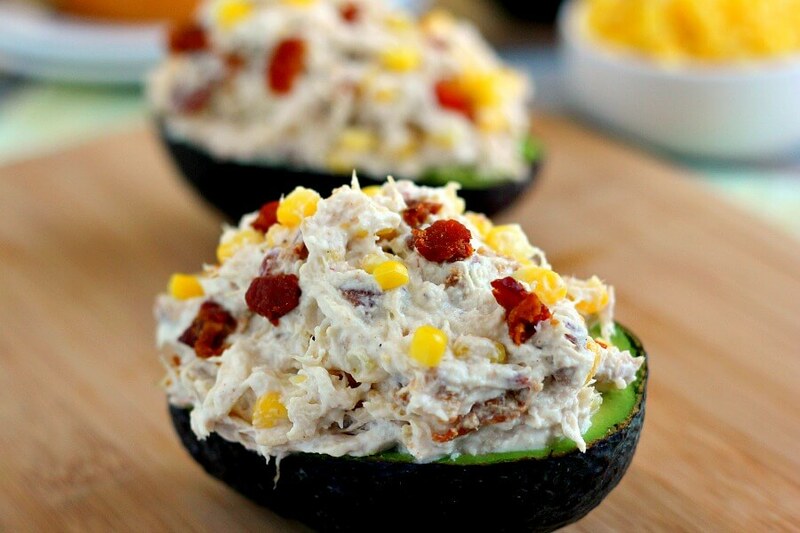 If you love avocados, then you’ve got to try chicken salad as a topper. You’ll fall in love, I guarantee it! So the next time your summer (or anytime) craving strikes, whip up this Lightened Up Zesty Chicken. Creamy Salad, light and calorie-friendly, this will be your go-to chicken salad. In a large bowl, combine the yogurt, mayonnaise, lemon juice, garlic powder, salt, pepper, corn, and bacon. Serve on halved avocados, a roll, or bread, if desired. Chicken salad will keep refrigerated for up to one week. I'm always a fan of tricked-out chicken salad! This one looks really fun and edgy, Gayle! Dinner at your house must always be one happy surprise after another! Haha thanks, Mir! I have to say that this is one meal that I make over and over again! Thanks so much for the kind words and pin, Blair! The bacon and corn give it a great burst of flavor! I love chicken salad and it does just feel so summery! I'm not a big mayo fan, so I always cut it or replace it with Greek yogurt. It's such a great trick. And um - the bacon in here. Yeah, I'm going to need that for sure! I love sneaking in greek yogurt whenever I can, too! And yes, anything with bacon equals a winner! I am so with you on wanting to eat ALL the summer foods! 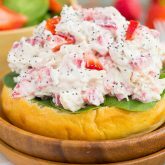 But, with all that eating, I'll need something to be lighter....enter this amazing chicken salad! I love that you used Greek yogurt here. Extra protein <3 Pinned! Thanks so much, Taylor! It's the perfect lighter dish without sacrificing flavor! I love finding new chicken salad recipes. It is perfect for lunch during the summer. I want to pile it high on some crackers! I know what you mean, my brain is on the summer foods too! I love love love chicken salad, definitely one of my go-to meals for lunch during a busy work week. And chicken salad with bacon? Yes please! Thanks, Heather! This is definitely the ultimate chicken salad! Gayle, I LOVE how you amped up this chicken salad!!! what a great idea!!! I seriously love this! I'm SO excited for grilling and fresh fruit galore! This chicken salad looks delicious and perfect for a picnic! Thanks so much for the kind words, Taylor! Ahhhh! Two great ideas...Greek yogurt and avocado. 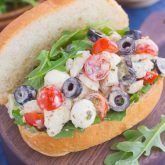 Sometimes there's nothing better than the perfect chicken salad sandwich and this one fits the bill! Thanks, Gayle! Thanks so much, Annie! The two just go perfectly together! I definitely won't judge if you just eat it with a spoon! :) Thanks, Sarah! I love chicken salad! This versions sounds phenomenal, especially with bacon. I am going to need to make this asap! Thanks, Jen! I hope you love it if you try it! Yum Gayle! Chicken salad is one of my favorites. I love the addition of bacon and corn here. I also appreciate that you lightened it up. I can eat avocados all day long too! It's the perfect combination of ingredients! Thanks, Rachelle! Looks so delicious Gayle and lightened up is always better!! Love the additon of corn here too! Thank you, Ami! I love the corn in here, too...so perfect for summer! This chicken salad looks super good Gayle!! Since my little daughter was diagnosed with egg allergy I love to use greek yogurt as a mayo substitute. This is perfect for a picnic!! Thanks so much for the kind words and for stopping by, Oriana! And I agree, this chicken salad is perfect for picnics! 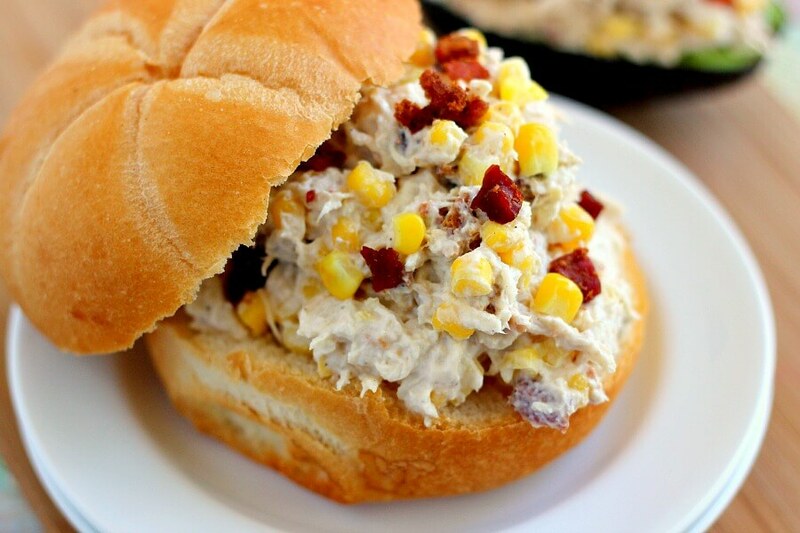 I love the bacon and corn additions in this chicken salad! That's such a great idea. Definitely trying this one, it looks fantastic! Thanks, Stacey! I hope you love it if you try it! This is such a great option because if you use an avocado its low carb! And I love that your substituted greek yogurt, yay for protein! It's the perfect summer lunch. Pinned! Yes! I love that too, Mariah! Thanks so much for the chicken salad love and pin! Looks like the perfect chicken salad Gayle! So pretty and I'm sure tastes delicious! Trying it soon! Thanks, Mira! It's my favorite summer salad! I can't stop thinking about warm weather foods! This chicken salad looks so delicious Gayle, and perfect for sunny days! Love that it's on the lighter side! Thanks so much for the chicken salad love, Nora! Chicken salad is one of my favorites. I love that you lightened it up. I also love the idea of eating it in an avocado! Thanks, Kelley! I love eating it in an avocado too, so tasty! I love salad and lightened-up versions are my special favorite! Great share, Gayle, also beautiful clicks. Thanks so much for the kind words, Savita! Thanks for the kind words and for stopping by, Lindsay! I am so excited about summer food too! Right now it's cold and raining, but I am dreaming of warmer days! This chicken salad is so perfect for warm weather -- pinned! Yes! Bring on the warm weather! Thanks for the pin, Ashley! I am ready for summer food too! 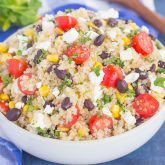 This salad has so many great flavors going on- yum! Thanks so much for the chicken salad love, Sherri! I love chicken salad, but haven't ever had a version like this one. This looks sooooo good, Gayle! I'm loving that you served it in avocados too, such a great idea. Thanks, Danielle! The extra ingredients definitely kick it up a notch! This is a great idea for leftover roast chicken. I don't know why I don't think of preparing chicken salad...thanks for the inspiration! Thanks so much for the kind words and for stopping by, Cali! What a perfect picnic recipe! This looks delicious! I am ready to jump ahead to summer foods too! 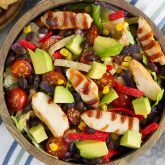 Love how you've lightened up this chicken salad and bacon and corn sound like such great additions! Thanks, Christin! It's gives this dish an extra boost! I can definitely eat avocados all day too! Love the idea to serve this in them! And it sounds fantastic - I don't think I've made chicken salad since last summer! Thanks for the kind words, Olivia! Oh man Gayle!! I want some of this for lunch today, tomorrow and the next. I love chicken salad!! And yay for warmer weather!! At least for you, hehe. Its to hot here. ;) PS love your photos! Gorgeous! Thanks so much for the kind words, friend! I love how you skinnified this! Yay for greek yogurt. Quickly becoming my best friend. Also loving the addition of corn in here. Yummmmy! Thanks so much for the kind words, Melissa! Chicken salads can be so heavy, so I love that you lightened this up with Greek yogurt, but that it's still indulgent with bacon! This is perfect food for a summer day!